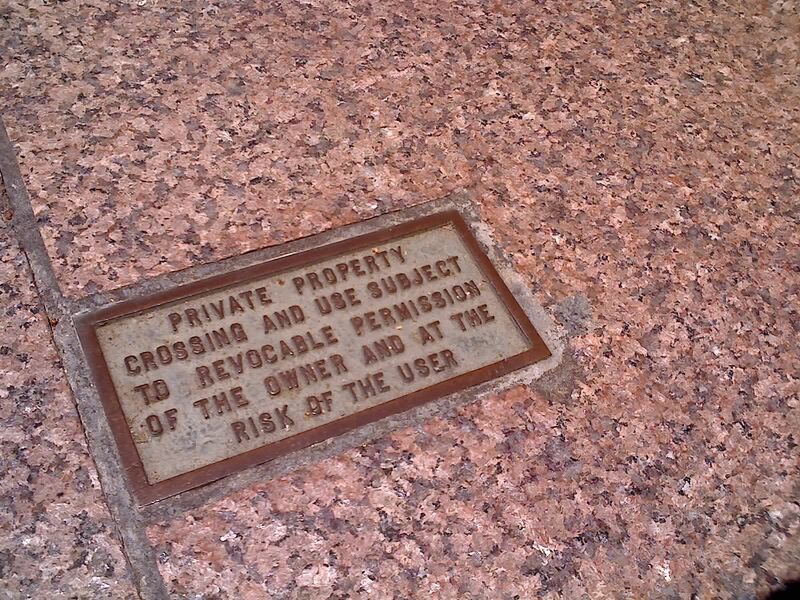 Sidewalks are Private Property in Downtown – is this houston? Spotted this monument placed in between the tiles on a sidewalk outside the Allen Center sidewalks across the street from the Downtown Hyatt. They are mostly to keep the skaters and the homeless off. What is Bill D talking about? This seems totally acceptable to me. What’s the big deal? Has he never left his house? Plenty of places have signs like this. Its essentially public property. Put up a fence and a guard if you really dont want anyone on it, instead of some subliminal demeaning sign. Could you contact me by email? I would like to ask you some questions about this photo. I edit Cite Magazine: The Architecture and Design Review of Houston.